Prick potatoes with a knife or fork. 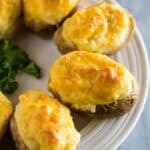 Bake potatoes at 400 for 1 hour. Remove from oven and allow to cool for a few minutes. Cut the tops off of the potato and scoop out the flesh into a mixing bowl. Add butter, salt and pepper, parsley, evaporated milk and other desired seasonings. Add more milk, if needed—it’s better if the filling is on the softer side because the potato mixture will thicken up as it cooks again in the oven. Top with shredded cheese and bake at 350 degrees F for 15 minutes of until the cheese is bubbly. For make-ahead and freezing tips, see the post above.